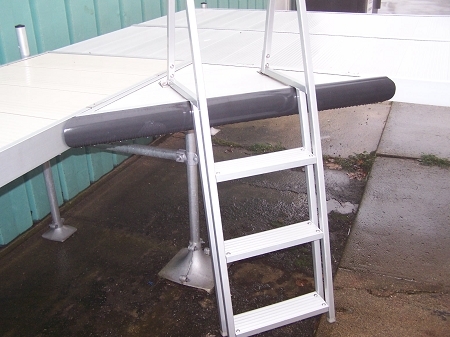 This ladder can be used for docks, swim platforms and pontoon boats. We manufacture it with anodized aluminum and stainless steel fasteners and brackets. It’s designed to last decades. The 3 step shallow water model reaches 33” below the dock surface and the 4 step reaches 45” allowing someone to swim up to the ladder and easily climb up. Railings extend 19” above the deck allowing easy access. Ladders can be removed in seconds without tools. Extra mounting kits are available if you want to use the ladder in more than one place. 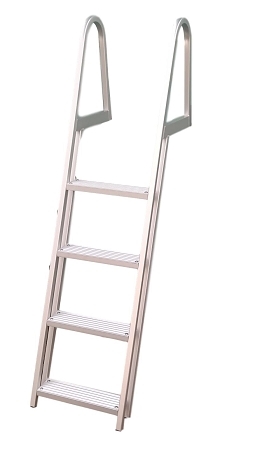 Watch out for foreign made ladders that look similar but have paper thin metal and poor mounting hardware.